Rhiannon Watt will once again don the red, white and black, signing on to St Kilda’s inaugural AFLW team. We’re really glad to have her back at the Saints. Watt, a recent convert to football, played volleyball for Australia before making the jump to the Southern Saints VFLW side in 2018. 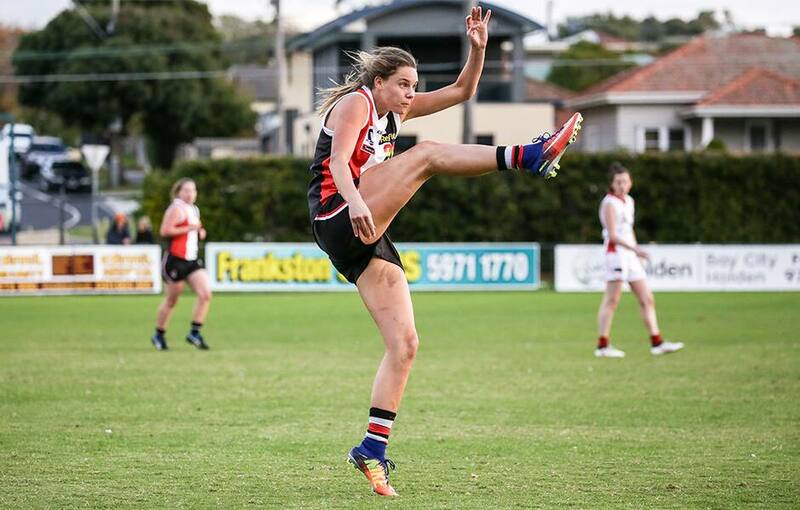 The life-long St Kilda supporter starred in the ruck in her first ever season of football, taking up an almost permanent residency in the best-on-ground conversation. The 31-year-old’s debut season saw several AFLW clubs take notice, with Carlton eventually pouncing with pick No. 40 in the 2018 NAB AFL Women’s Draft. The 184cm utility played two games for the Blues in defence, with highly regarded duo Breann Moody and Alison Downie preferred in the ruck roll. Watt said she was thrilled to be re-joining St Kilda. “It feels great to be home,” Watt said. Reflecting on her time with the Blues, Watt said experiencing AFLW only further added to her skillsets both on and off the field. “It was a pretty incredible experience [at Carlton]. It was unreal to play at IKON Park in front of more than 5,000 people. It was really enjoyable. Watt was the co-recipient of the inaugural Southern Saints VFLW best-and-fairest alongside fellow returned Saint Ali Drennan, a partnership she’s keen to reignite. “There’s no denying Drenno [Ali Drennan] and I have a fair bit of chemistry going on,” Watt said. She’s a really good mate of mine and I think the pride we feel when we pull on the Saints jumper, you know being a St Kilda supporter since I was really young, it’s just something that’s really exciting for me." Head of Women’s Football Peta Searle said Watt’s skills on field were only matched by her passion and leadership off it. “Rhiannon is such an important person when I think about factors that will build the culture of this team,” Searle said. “She’s shown that she’s talented on field, and her year in the AFLW competition will only have added to that, but her team spirit and the importance she places on bringing up those around her is such an asset.